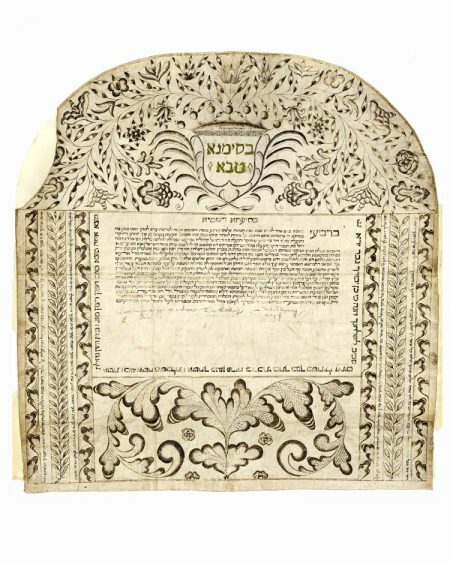 This rare ketubbah commemorates a wedding within the small but prominent Jewish community of the town of Bayonne, located in southwestern France near the Atlantic coast. The community was founded by anusim who fled the Portuguese inquisition in the sixteenth century and settled in select towns in the south of France. At first, the merchants among the anusim were prohibited from dealing in retail trade. In 1636 several Jewish families were expelled from the town. The Jews of Bayonne were not permitted to openly and officially practice Judaism before 1723. The decoration of this ketubbah reflects styles and designs common among Western European Sep- hardim. In most communities, aside from those in Holland and Italy, depictions of human figures were avoided, while floral motifs and diverse decorative designs were emphasized. These contracts were created primarily by Sephardic folk artists who executed a variety of other works for their communi- ties, such as Esther scrolls, Passover Haggadot, and Omer calendars. The present example is decorated only with ink, creating a sharp contrast between the clear white background and the emphatic black ink. The mostly floral designs are dappled with dots and tiny lines that create the look of a copper engraving. Appearing at the top center is a large crown with seven knobs that alludes to the accompanying inscription, “A wife of noble character is her hus- band’s crown” (Proverbs 12:4). Dowry: 30,000 litrin, French coinage (livre); increment: 15,000 litrin; total obligation: 45,000 French litrin.